Journal, which were those published between Autumn 1999 and Spring 2003. George Pascoe describes his experiences as second-in-command of a Ten-Pounder Talbot Battery in the Arab Revolt, including his meeting with Lawrence. possibilities of a film about Lawrence. But placing Lawrence on the silver screen was fraught with obstacles, as film historian Andrew Kelly describes. Beethoven and Elgar were Lawrence’s favourite composers. Learning that Elgar, despite illness, was working on a third symphony, Lawrence sent an encouraging letter. Dr Christopher Joyce gives the history of the unfinished sketches for a third symphony and Anthony Payne’s later contribution. In his March 1955 review of Richard Aldington’s book, Christopher Woodhouse, commenting on the uproar caused by its publication, stated that it was not ‘conducive to calm judgement, and probably years will have to pass before the dust settles.’ Forty-four years on, can we say that the ‘dust has settled’? Nick Lynch follows Lawrence’s return journey from Carcassonne to Chartres in 1908. Moshe Sharett’s book Shall We Ever Meet Again contains letters to his family and friends during 1916-1918 when he was serving as an officer in the Ottoman Army. Uri Thon has translated some of these letters into English. They give an interesting insight into what was happening ‘behind the lines’ at the time of the Arab Revolt. occasion, when an Arab force was attacked by enemy aircraft, the day was saved by the unexpected arrival of a single RAF B.E. 12a aeroplane piloted by Hugh Junor. This intervention was sufficient to divert enemy attention from the ground force. Jo West, a descendant of Junor, gives a short account of his life and untimely death. The late Dr Bidwell’s 1976 essay, reprinted here, drew attention to questions about Lawrence that he felt needed answers. Some of the points he raised have now been dealt with, or partially dealt with, by subsequent biographies; but the questions remain interesting. In carrying out its responsibilities, the National Trust does not only aim to preserve the fabric of buildings, but to retain their spirit. As James Grasby states in his article, the aim should be to show Lawrence’s cottage, as far as possible, as it was during the latter days of his occupation. To achieve this it will be necessary to make some changes. Gillian Stevenson and Martin Robson Riley have produced A Dash of Scandinavian after studying the maternal ancestry of T. E. Lawrence. In Vol. IX, No.1 we published an article by George Pascoe in which he gave an account of his service with the Motor Section of the Royal Field Artillery during the Arab Revolt. His son John Pascoe, in collaboration with St. John Armitage, has now been able to put together a more detailed account using extracts from the official War Diary and photographs from the Brodie and Pascoe family albums. Maria Alonso has translated an article on Lawrence written by Victoria Ocampo and first published in 1955. Jeremy Wilson: Did Lawrence have a Long-Term Influence on the History of the Middle East? Jeremy Wilson points out in his article that – in the historical context – Lawrence’s influence on Middle Eastern political events after World War I was limited. Harold Orlans’ subject is the relationship between Lawrence and his mother. This provides another example of the complexity of Lawrence’s mind and how his ambivalence caused mental tension. Lawrence’s war experience was restricted to guerrilla warfare, but as George Gawrych points out in his article, some of the principles enumerated in the Twenty-Seven Articles and Lawrence’s other writings can be applied to the wider field of regular warfare. biographer Basil Liddell Hart. The friendship flourished as they found that their thinking on military strategy had much in common. Their personalities, however, could not be more dissimilar. relates how he spent several weeks in Trans-Jordan, taking over from Lawrence the post of Chief British Representative. In his book Acquaintances, Arnold Toynbee gives a sketch of twenty-four friends and acquaintances. One of his subjects is Lawrence. In this excerpt from his autobiography, John Rothenstein recalls his first meeting with Lawrence when his father, Sir William Rothenstein, was painting a portrait of Lawrence in Arab dress at his studio in London. The friendship continued. water, Plymouth. His contribution there is set out in Keith Beardow’s article taken from his book Sailors in the RAF. Malcolm Brown, who has been a freelance historian at the Imperial War Museum since 1989, describes those exhibits associated with Lawrence. Jeremy Wilson investigates why Lawrence should have chosen London as his favourite place to live. Starting from Lawrence’s youth and tracing through to his last days, Harold Orlans has extracted from numerous sources constructive evidence to show, over the years, how complex his attitude to money was. In 1978, Edward Said published Orientalism, a general survey of Western attitudes towards the East. Lawrence is portrayed as an Orientalist, which meant that he supported imperialism. Here, Susan Williams criticises Said for not taking into account substantial evidence that significantly qualifies his contention that Lawrence was an ‘agent of empire’. V. S. Pritchett wrote a number of literary essays on eminent persons, including two on Lawrence. 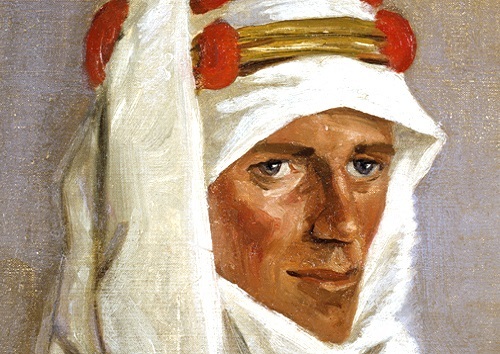 The later one, T. E. Lawrence: The Aesthete in War, is reprinted here. William Morris’s craftsmanship appealed to Lawrence, but above all it was his writings that gave him greatest pleasure. The correspondence between Lawrence and his mother reveals the affection each had for each other. Four letters from Sarah, when she was in China with her eldest son Robert, are published here for the first time. A Critic in Action sets out to put the record straight insofar as David Lean’s film, Lawrence of Arabia, portrays an historical event. H. A. Corbett points out that historical films are not noted for accuracy. information about the Arab Revolt, John Knowles argues that there is a need to rectify the inaccuracies that have been given such wide publicity. Sam Moorhead describes in detail the information that Lawrence was able to acquire during the Wilderness of Zin survey expedition, and although the title of his article may be a little sanguine, it does highlight how valuable to Lawrence those two months proved to be. Lieutenant Thalacker, of the German army, was in charge of the railway station at Amman in 1918. He gives a first-hand account of what it was like to be at the receiving end of the assaults made by Feisal’s army and the Allied Air Forces on the Hejaz railway. Sara Johnson’s article consists of three essays covering the intricate creation of Seven Pillars of Wisdom and the influence other writers had on the author, especially William Morris and Robert Vansittart. Jonathan Black provides us with an article illustrated by photographs from the Kennington family’s collection.